Impress Your Girlfriend With These. Pay Later. 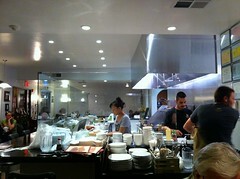 This isn’t to say that Sister Kitchen in Grover Beach doesn’t also have great noodles, great curry, etc. They do. In fact, a good part of the fun is trying new things every time I go like the pumpkin or pineapple curry, fresh spring rolls, or Thai eggplant dishes. But this place comes with a warning for all you heat-seekers out there. I love spicy food, as you know. But before you try to impress the girl you’re with by ordering the “Extra Hot” option, start with “Medium” until you get to know the place. You can do what I do to impress my wife (though that doesn’t happen much any more) and order the spicy condiments to pile onto your food if you’d like. That’s my recommendation. You’ve been warned. No Mystery Meat in This Kitchen. Now back to our regularly scheduled programming. The food. My first indication that this Thai restaurant was different was the open kitchen in the middle of the intimate room visible right as you walk in. For me, this is a HUGE plus. The thing about a lot of Asian restaurants I’ve been to is that I order these really delicious sounding, complicated dishes, and less than five minutes later, it’s sitting in front of me. That has always worried me. What exactly is behind those dark doors that makes their food service so efficient? I’m not sure I’ve ever really wanted to know the answer to that question. Luckily at this place, I don’t have to guess. The Perfect Cool Opener for the Heat About to Come. So we know the preparation is fresh, because we can watch it, but what about the ingredients? Here, too, I have always been pleasantly surprised. 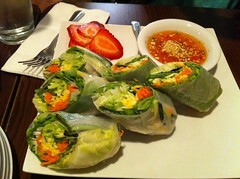 Even just looking at the picture of the Fresh Spring Rolls on this page is no indication of how crunchy and robust these big bites are. Very light with transparent rice wrappers so you can see all the bright carrots, julienned cruciferous veggies, and some dark green leaf that tastes like a kind of mint that really lightens the flavors of the dish to match the vibrant colors. Dip liberally in the delicious sweet and spicy sauce. This is an incredibly cleansing, light and satisfying first dish. I recommend saving some to cool you off later. “Cool me off later?” you chide. “Yes.” I smirk. The stuff that really draws me and my Thai-loving friends back are the incredible curries. Here, too, you won’t find a mushy bowl of overly creamy mystery sauce covering some unrecognizable curly protein of unknown origin. What comes to your table is a bowl that’s more soupy in consistency because you’re getting all of the delicious spices, coconut milk and veggies stirred up fresh for you, without reducing in a pot for some indeterminate number of hours waiting for you to order and be served in five minutes. If you’ve ever made stew, you know that the secret to success is the amount of time you let it cook to marry the flavors – the longer the better. 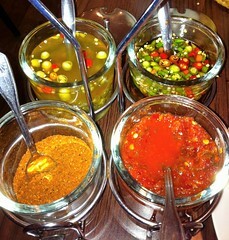 But there’s magic in the way these sauces are made. They come out incredibly rich and well-blended, though a little thin because of the lack of cooking time. If you can get past that, I challenge you to find better, denser flavors elsewhere that aren’t fatty or cloying. Bright, Complex, Spicy and Creamy Mussamun Curry with Beef. Every curry we’ve tried has been great, however we keep coming back to the Mussamun Curry, made with red curry, potatoes and coconut milk. If you’re a red curry fan, you may find it a stiff competition between the house Sister Curry which adds kaffir lime leaves, bell peppers, peanuts and basil. For something a little different, try the Green Curry with tiny spherical Thai eggplant – not the mushy stuff you may be used to. And though other restaurants serve something similar, you have to try the Pineapple Curry. All of them come with your selection of meat. I highly recommend this one with pork. 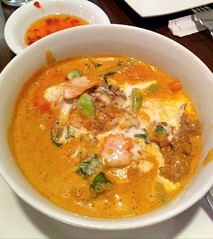 There’s also Pa Nang, Yellow and the aforementioned Pumpkin Curry to lure you back. “What’s your price for flight?” you ask. Most everything is between six and eleven bucks. Maybe two dollars more than you might pay for the delight of a five-minute mystery meal at some other Thai place, but I think the freshness and masterful mixtures are worth it. As always, check Sister Kitchen out for yourself and report back on your thoughts. Can you believe – I have yet to discover Thai food. Doug, Carter and I went the other night and he had the Sister’s Curry and I had the Green Curry. They were both killer. We actually had a bit left over and this weekend I scrambled some eggs mixed in the curries and dribbled a bit of tres quesos on it. I did not need any other spices, the eggs were killer. The small amount of brown rice mixed into the curry made for a dish that I didn’t need to have toast. It was actually pretty healthy and what a wonderful taste sensation. It was still pretty spicy. Sister’s rock on!!! !